I will be sending a skein of sock yarn to the first person who guesses correctly or I'll do a random pull of a name if no one guesses correctly! This is the layout I think I'll go with. I love the look of these but oh my, they eat a lot of fabric. The folding and pressing seemed to go on forever for this block. I've seen them become really cute pillows so that my be this one's destiny as well! The chair fabric! How awesome. I'm in agreement with Mandy. How cute is that chair fabric? 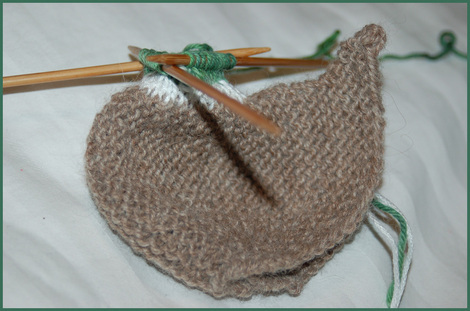 No guess on what the knitting is ---- the mystery grows! 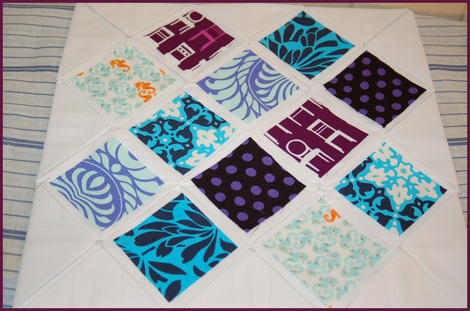 I Sooooo love this modern quilt beginnings. Nothing prettier than bold colors with white. This page contains a single entry from the blog posted on May 27, 2011 9:00 AM. The previous post in this blog was Deep Sea Dance quilt and a mystery knit.